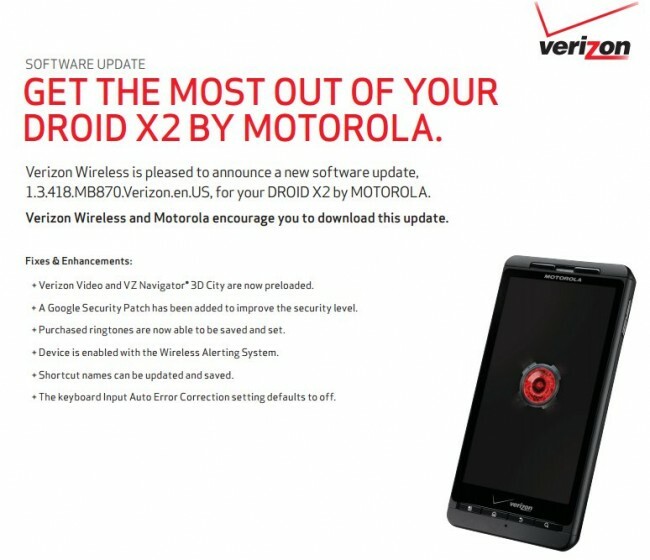 We first learned of a new software update for the DROID X2 back on March 12 that we expected to be nothing more than a bug fixer. Since Motorola and Verizon seem to have decided that the dual-core powered phone is not worthy of Ice Cream Sandwich, what else could it be? The changelog has now been posted and we see that a new security patch is included (goodbye, root? ), new Verizon Video and VZ Navigator 3D apps preloaded, and some other mostly meaningless add-ons. The new build number after updating is 1.3.418. The update will run you 35MB.